If your trip is in the morning and 3 hours or less then please set the end time no later than 1330 hrs. This allows us to run an extra trip in the afternoon. If you would like to discuss a short trip leaving later, then please use the Contact area. we have a pair of kingfishers living up a side stream near Hemingford Lock and also another pair living in the bank beside the meadow in St Ives. Tues 11 - Thurs 14 June. For Schools Introduction to history of the local river. Workshops and hands on events at Norris Museum and a trip on the Ladybird Boat. Contact the Norris Museum for further information. 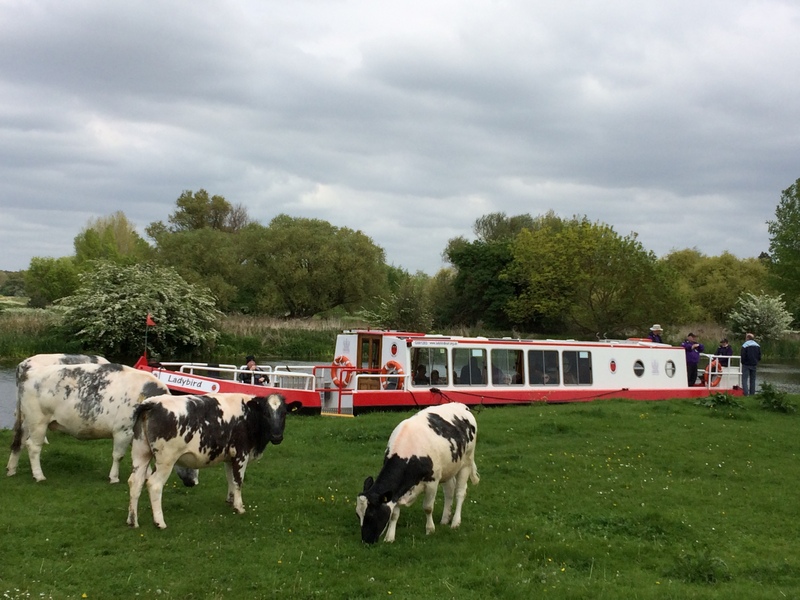 The Ladybird Boat Trust (LBT) was set up in 2013 and is based at Hartford Marina near Huntingdon. 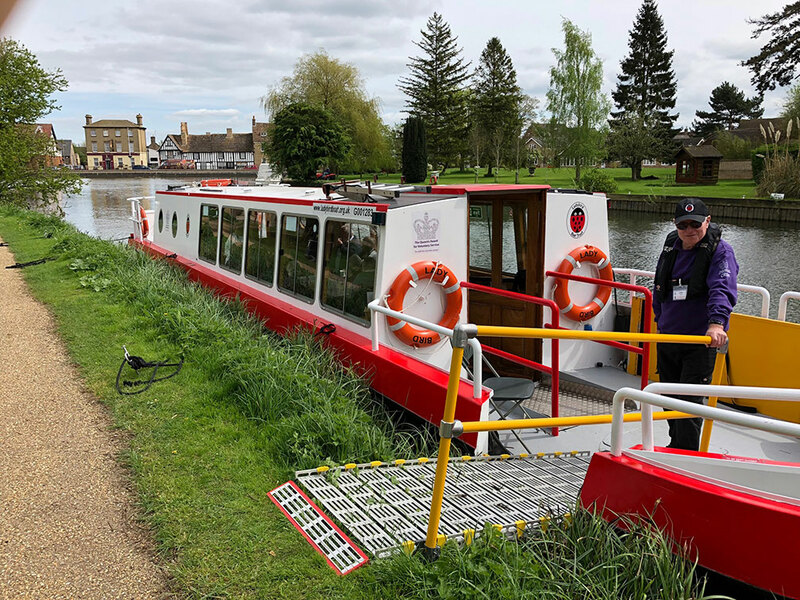 The vessel Ladybird is wheelchair accessible and accommodates up to 20 passengers in a large heated cabin complete with kitchen and wheelchair accessible toilet facilities. The open foredeck area enables passengers to enjoy to the full the magnificent scenery and wildlife on the river. The service operates from mid April to early October and is crewed by a Boatmaster and trained crew, all of whom are volunteers who give up their time and skills to run over 100 trips each year. 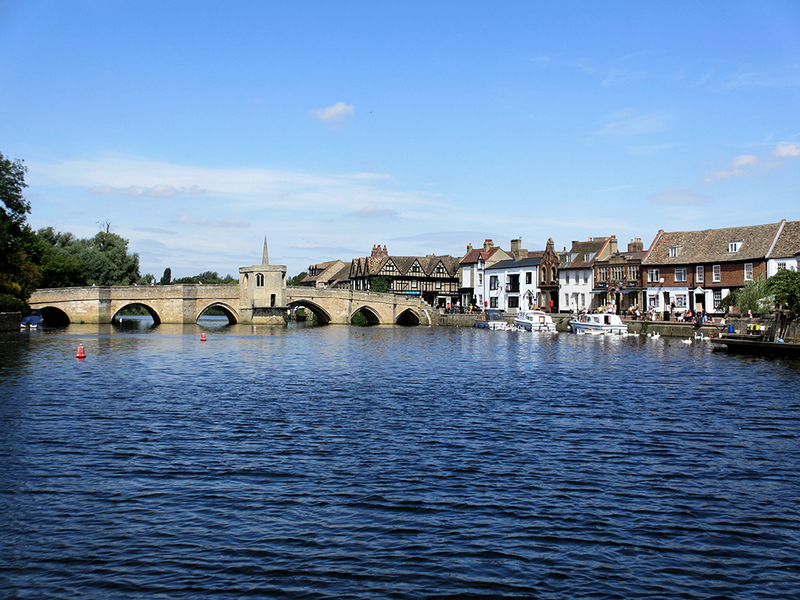 A typical trip is between 10am and 3pm, and is either upstream towards Godmanchester and Brampton, or down to the Hemingfords and St Ives. More information on possible trips and time to allow can be found in the Frequently Asked Questions (FAQ). 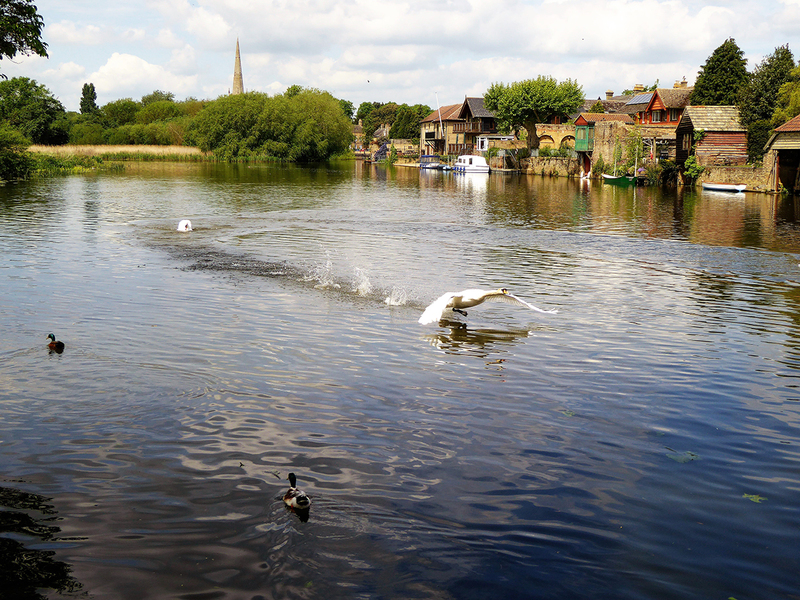 Trips are open to groups of the disadvantaged or disabled, young or elderly (and their carers) based within reasonable road travel distance from our base on the Great Ouse near Huntingdon, Cambridgeshire. 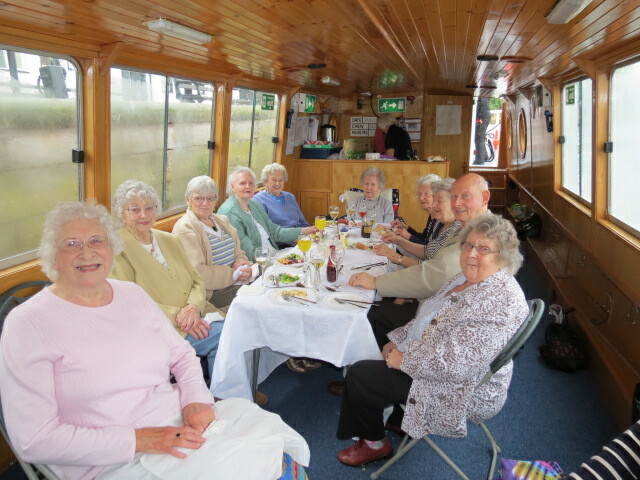 Many groups return year after year and the annual boat trip is a highlight in their year. In 2018 we had nearly 140 bookings made and we welcomed many Specialist Groups, Day Centres, Care Homes and many other groups. The Trust works hard to cover the £17,000 annual running costs and is fortunate to have generous donors who continue to support its activities. If passengers are able to make a donation themselves this is always very gratefully received. The major costs we have to meet are include Mooring fees; Insurance; Maritime & Coastguard Agency annual survey costs; Maintenance & lift out costs and Fuel. We run a number of trips for small groups and individuals with their companion/carer. We leave Hartford Marina at the time indicated and travel towards St Ives or Brampton Lock. If you would like further details then please email events@ladybirdboat.org.uk. Please provide a telephone number if you would like us to ring you. Trips are running on the following days. Listen to an interview on Huntingdon Community Radio about the Ladybird. It is a fairly big file so please be patient whilst it loads! Listen Here. Watch a video about the Ladybird by clicking on this link Here. Read a letter from Sir John Baird Here. Please find a selection of commonly asked questions and answers below. Are you able to cater for impaired mobility including wheelchairs? Vehicles can unload passengers close to the boat. The boat has wheelchair accessible toilet facilities and easy access for all users, including those in wheelchairs. How much will the trip cost? We are an independent charity, and raising the money to continue to operate is an important issue. If you are able to contribute in any way, all donations will be gratefully received and will help support those less fortunate. We are often asked what a suitable donation would be and, whilst the crew are all volunteers, we have fixed costs of insurance, mooring fees, maintenance, and fuel which amount to approximately £17,000 a year. We do not set a fee but request that where possible passengers donate towards the costs. When asked, we suggest that those who can afford it donate £12 for a 4/5 hour trip. However we understand that for a shorter trip you might to donate slightly less. This would just about cover our costs. I am sure you will agree that a contribution of this size is good value for a day’s outing on the river. However we are committed to providing free trips for groups or individuals who, for whatever reason, are unable to contribute to our costs. What days does Ladybird operate? Normally trips take place Monday to Friday from April –September inclusive between the hours of 10am to 3pm. However on days when we run two shorter (2-3 hour) trips there is more flexibility on times, possibly until 5 pm. We also operate a limited number of extra trips which are available at weekends or in the evening (subject to crew availability). Where can I go on the river? This depends on the length of the trip booked which can be from 1 - 5 hours and whether you wish to stop for a picnic or get off the boat. The following are some ideas and are given as a guide to timings starting and finishing at Hartford Marina. Please email us if you wish to discuss your trip. If at all possible we would prefer that trips of less than three hours are booked for morning (to finish by 1330hrs) so we can offer another short trip in the afternoon. Please note river conditions on the day can affect any pre-made plans and so cannot be guaranteed. Through Godmanchester Lock and into Godmanchester Basin to moor for a picnic or have fish and chips delivered to the boat. Hemingford Grey (stop for picnic) via Houghton Lock and return. 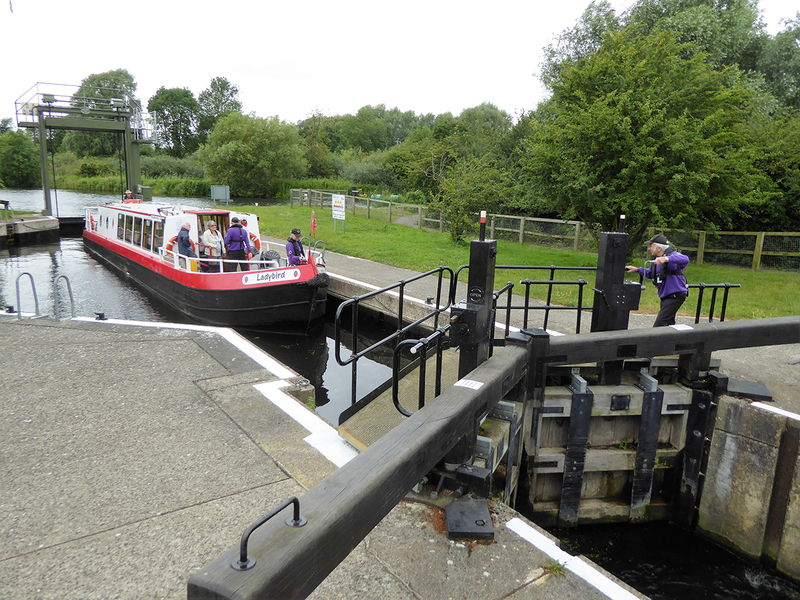 Three hours trip to Brampton Lock or Hemingford Lock followed by carvery at Hartford Mill. Travel to St Ives (no stop). 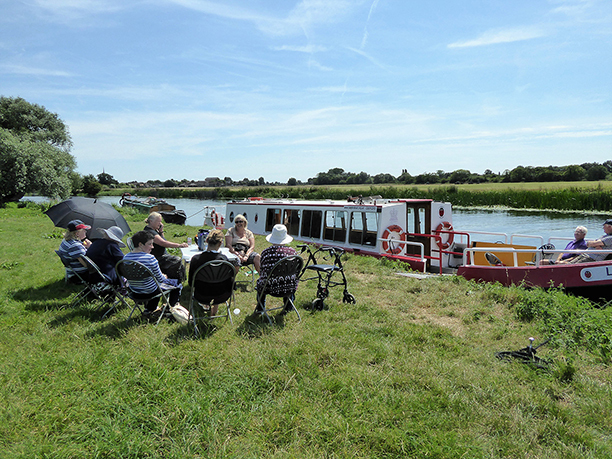 Travel to Hemingford Lock, stop for picnic at Hemingford Grey then travel upstream to Huntingdon and return to Marina. Travel to St Ives - Collect fish & chips (no stop). Travel to Brampton Lock ( and possibly beyond) and stop for fish & chips at Godmanchester on return journey. Travel to St Ives with approximately 60 to 75 minutes to leave the boat for a meal or to walk around the town. Monday is market day (smaller market on Friday). Travel to St Ives and have a picnic on Nobles field overlooking the meadow. The furthest we can travel (without stopping) is the Ferryboat Inn (via St Ives) or Paxton Pits (via Brampton). Travel upstream through Brampton Lock and stop for fish & chips at Godmanchester. What options do we have for refreshments and food? Your group has a number options for refreshments and food, depending on the length of time your trip is booked for and the distance that your party is able to walk. If you would like further advice then please discuss with us when you make your booking. There is a small galley kitchen on board with microwave and hot water heater. You need to bring your own coffee, tea, milk, other drinks and utensils that you might require. You might wish to bring your own food and this can be eaten on board or we moor beside the bank and you can picnic on the riverbank or in a park. You might wish to have food delivered to the boat or stop at a restaurant or pub. These are some suggestions. However organisation and booking of this is your responsibility. Fish & chip can be ordered and collected from Riverside F&C shop (normally they will deliver to the boat). Provided there is sufficient time and dependent on the weather, the food can be eaten sat in the park. Dolphin Hotel - Provided you have booked a 5 hour trip and leave at 10am you might wish to prearrange for a sit down meal at the hotel. We can moor beside the Dolphin Hotel although it is essential that you book the mooring for us at the same time as you book your meal. Rumbles Fish & Chip shop – The mooring at the Waits is about 100 metres away. Fish & Chips can be collected to eat on the boat (min 4 hr trip). Please allow at least 4.5 hrs to eat in the restaurant. There are other pubs and cafes that might be available depending on the size of the group. The Hartford Mill is about 100 metres from the mooring. A carvery is served between 1130-1430 & 1630-2030 every day. Non carvery meals are available all day. We are dependent on the generosity of patrons, sponsors and crew members to meet the running costs. Our major costs include mooring fees, insurance, Maritime & Coastguard Agency annual survey costs, and fuel. How can I support the Ladybird? Please check back for updates or, if you require further information, please contact us. Crew will be present to provide safe entry and exit to the Ladybird. Before your trip commences the Boatmaster will provide information and a safety announcement will then be played. The Marine and Coastguard Agency who licence the boat require and inspect our Safety Management Plans for responding to emergencies and that risk assessment for passengers and crew members have been carried out. During the winter months crew carry out training which includes dealing with emergencies, risk awareness and first aid refresher courses. Have a look at our gallery, If you have any you think would look nice on this page, please email them to us! 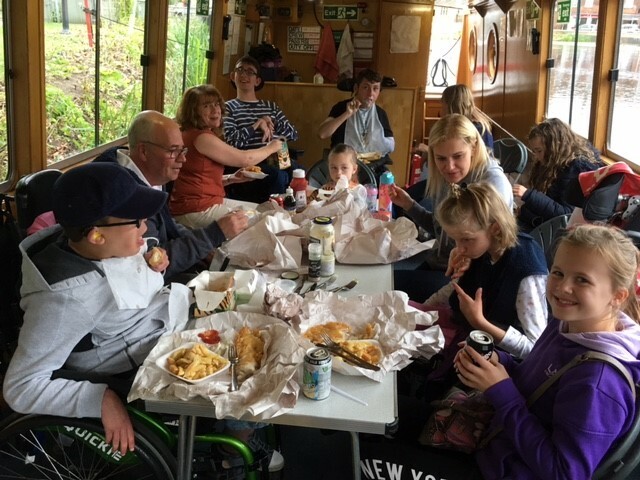 The Ladybird Boat Trust would be delighted if you would consider helping us financially, thus supporting our work in providing free river based trips for disadvantaged groups. Even though all our crews are volunteers it does cost a lot of money each year to provide the trips. We are grateful for any donations, big or small. If you have questions about our events, don't hesitate to send us your message. Please use the contact form if you have any questions regarding the Ladybird boat or bookings. If you would like us to telephone you then leave a contact number and a brief description of your query. This mobile is only manned during trip hours, and is for emergency use only. Please only use if you need to contact the boat on the day of your trip. This number will attempt to find an available volunteer however you might wish to leave a name, phone number and brief message and someone will call you back.